International Master William Paschall (Mrserious) Experienced teacher, commentator and video lecturer. 20 Years teaching and training in chess. 2 Time Massachusetts State Champ / 3 Time New England Champ. Thousands of hours of private lessons and video/live commentary experience. Study chess in English with a clear and natural communicator! Experienced teacher , commentator and video lecturer. 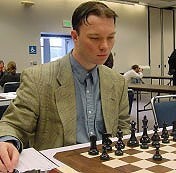 20 Years teaching and training in chess. Thousands of hours of private lessons and video/live commentary experience. Study chess in English with a clear and natural communicator !